Erleiden Führungskräfte einen Zusammenbruch, macht man Stress und Arbeitsbelastung verantwortlich. Was aber steckt wirklich dahinter? Management derailmentEntgleisung; hier: Scheiternderailment is a very serious issue. When high-flyingerfolgreich, hochkarätighigh-flying executives to lose the plot (UK, ifml. 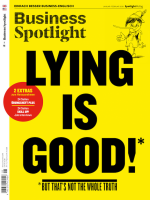 )den Durchblick verlieren; hier: durchknallenlose the plot and fail to deliver, it can have devastatingverheerenddevastating consequences for their families, colleagues and firms. Figures on derailment are to be hard to come byschwer aufzutreiben seinhard to come by. Derailment used to be called “having a nervous breakdown”. Then it was called “work-induced stress”. And many people still think that derailed managers are victims of excessive stress caused by overwhelmingerdrückendoverwhelming job demands. But there is a difference between a breakdown and derailment. We are all to be vulnerable to sth.für etw. anfällig seinvulnerable to breakdowns caused by stress. Derailed managers, however, have personal characteristics that manifest themselves in problematic behaviours. These are often overlooked or forgiven. But in stress situations, they can lead to derailment. One example is the micromanagerFührungskraft, die alles bis ins kleinste Detail kontrolliertmicromanager. Control freaks have an anxiety-based disorderAngststörunganxiety-based disorder with many causes. Unable to trust others, they believe there is only one way to do things — their way. But as they move up in an organization, they are expected to lead rather than to supervise (sb./sth.)(jmdn./etw.) überwachensupervise. And that means allowing others to to get on with sth.mit etw. weitermachenget on with the job. Derailed micromanagers are unable to to let goloslassenlet go. Then there are the borderline psychopaths. They will do anything to get their own way. They lie, to cheat (sb.)(jmdn.) täuschen, betrügencheat, steal and know how to manipulate others. They can be very charming when they want to be. And they are particularly problematic when they are both intelligent and good-looking. The backstabbinghinterhältig; hier: voller Intrigenbackstabbing battleground of most business life is the ideal playground for these individuals. When they derail, it is often with spectacular consequences. A third example is the narcissist. Having high self-esteemSelbstwertgefühlself-esteem and being able to protect your own interests is thought to be a good thing. But a key task of managers is to help achieve goals through others. By means of target setting, continuous support and regular feedback, managers can achieve a great deal. Narcissists, however, are too concerned with their own needs, and staff often feel lost, ignored and forgotten. Other characteristics that cause derailment include having excessively low emotional intelligence or being unwilling to learn and adapt. In all cases, it is the character weakness and not the stress that is the problem. So when you meet a charming, self-confident manager who is to be eager to do sth.erpicht darauf sein, etw. zu tuneager to to be hands-onsich tatkräftig einbringenbe hands-on, beware!aufgepasst!beware! There may be something very different to lurk behind sth.hinter etw. lauernlurking behind that mask of confidence.